Unsung heroes. The description fits well thousands of volunteers who spend hours and hours at the relief centers silently doing their part to help. They are there without expecting to be recognized or be featured in newspapers or television. They may look tired for a day’s work but they managed to wear a smile. 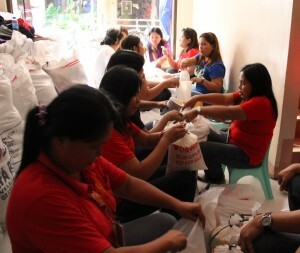 It’s just their pure heart to help and the spirit of volunteerism that is at work here. Kudos to all of you! This entry was posted in Act of kindness, Inspirational and tagged kudos to volunteers, relief center, relief operation, volunteer, yolanda volunteers on November 23, 2013 by Yami. This entry was posted in Inspirational and tagged best money tips, financial quotes, financial tip, money problem, money woes on November 8, 2013 by Yami. Nowadays, bass guitar is of utmost importance in musical industry because this is a versatile musical instrument that acts as a bridge between lead instruments and vocals. There are many ways from where you can Learn Bass Guitar but the best is music of yesteryear. This music contains a perfect blend of base guitar with lead instruments and offer music that rock listeners. Though, there are also several websites available online which have regular bass guitar lessons but still music of yesteryear is the best among all. One can learn to play base guitar easily but smoothness in playing comes with large experience of playing. This entry was posted in Music and tagged learn to play guitar on November 2, 2013 by Yami.